Purple cone flowers and sunflowers in our back garden. 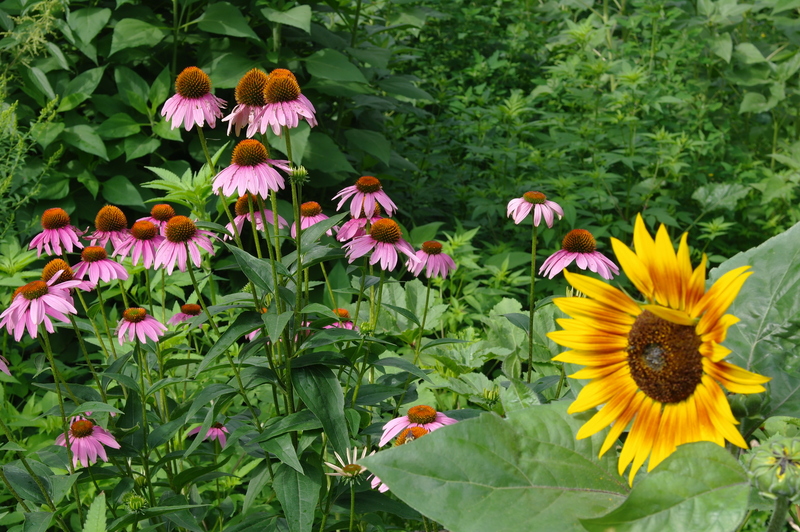 Both are great pollen sources for pollinators and also add beauty to our landscapes. It is a beautiful afternoon here in West St. Paul, Minnesota. There are a few clouds in the sky and a light breeze keeping this early August day at a nice temperature. I am enjoying the modern luxuries of a few cold beers and a laptop in my backyard, a pork roast and chicken breasts being slowly smoked on the grill, and looking out over a garden filled with apple trees, sunflowers, and all other kinds of plants that the bees, birds, and butterflies are loving! There are a few monarchs flying about and perching on the purple coneflowers, presumably enjoying the sun just like I am, and aside from the honey bees, there are also bumblebees, solitary bees, mason bees, and many other types of pollinators that I do not know the names of. Some are wasp like insects that are all black with a blue sheen and long abdomens, others appear to be half honey bee half fly, some look like apis mellifera, but are just different enough to be their own species. But one thing all of these little critters have in common is their love of a healthy place to live. All of our gardens, but especially the backyard garden that I am writing this next too, is a fairly overgrown collection of native and non-native perennials, self seeding flowering annuals, fruit trees, cooking herbs, and an assortment of other “weeds” that call this piece of ground home. For at least the last ten years there have been no pesticides or herbicides used on my property. While I can not say the same of some of my neighbors, most of the yards around here have a bit of a wild side on parts of them. Our neighborhood is one of the older ones in this part of town with some of the oldest houses dating back to the late 1800’s. Due to this, the demographics around here tend to lean towards the lower-middle class end of the spectrum, and many people that surround us (but not all of them) do not bother with heavy chemical lawn and pest treatments, which, as far as the bees and other pollinators are concerned, is a good thing. 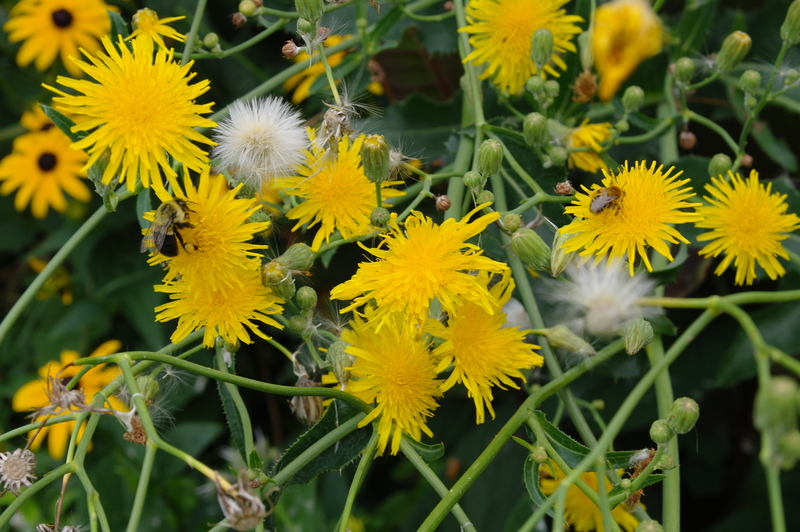 As a result there are catnip plants, thistles, burdock, wild lettuces, purple loose strife and all other sorts of flowering weeds along the forgotten edges and property lines throughout the neighborhood. You do not have to look hard or far to find fall asters, lambs quarter or dandelions, and there is a perennial ground cover of Creeping Charlie and white clover in many of the yards around our hood. While this may not be aesthetically pleasing to the city council, or the folks who tend to their lawns with a devotion that is on par to religious fanaticism, this is a good thing for the honey bees. 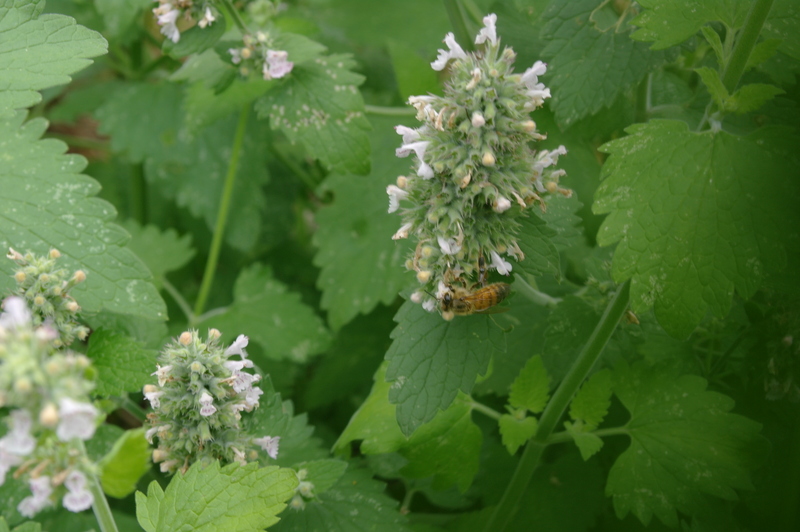 These overlooked edges, and backyard weed orgies may be the honey bees (and their wild cousins) best hope for their ultimate survival. It could be argued that urban neighborhoods like mine, with all the traffic and smog of city living, may be cleaner places to live and provide a more complete, and diverse diet if you are a honey bee. A bumblebee and another wild cousin foraging on wild lettuce flowers. While I am not typically a doomer, and try to stay rooted in reality, the honey bees are in a bad place right now. You do not have to look far in the world of online or print media before you come across a piece about the plight of the honey bees. Millions of bees dead in Canada, CCD getting worse, and struggles to get crops pollinated are all making headlines on a daily basis. Are these headlines exaggerations? I do not think so at all. While I do not think the honey bee is going to go extinct anytime soon, I do believe that the food production system (which is based almost solely on honey bee pollination) that we have built over the last 100 years or so and rely on for almost all of our food is in great danger of collapse. Mainly for the simple reasons that it is too big, too polluted, too dependent on fossil fuels, and no less damaging to the planet and her inhabitants when compared to things like clear cutting, mountaintop removal, tar sands, or hydraulic fracturing. It is almost a catch 22. If it weren’t for the honey bee, we would never have been able to start growing our food the way we have over the last 100 years. But now it is this same mode of food production, the megalith of industrial agriculture that would not be possible without apis mellifera, that is killing off the honey bee. Because we have plowed up so much land, or in the words of Earl Butz – “Fencerow to Fencerow”, and have replaced it with monocrops of GMO corn and soybeans, almonds and other regional crops that are all dependent on huge inputs of fertilizers, fuel, herbicides, and pesticides; we have basically created food deserts for all of the pollinators and other wild critters that use to called these areas home. So is it possible that urban and semi urban (especially those in lower income) areas could be the honey bees saving grace? I think it may be so. Acre for acre, more poison that is harmful to insect and plant life (and all life in general) is being applied to rural land, especially in the areas that are growing corn and soybeans. Glyphosate and Neonicotinoids make up the majority of the chemicals being used in modern agriculture and are being implicated with each new study as one of the main causes in Colony Collapse Disorder. Add to that fungicides, loss of habitat, varroa mites, and an artificial diet of high fructose corn syrup that is being fed to the bees to replace their stolen honey and lost forage of flowering “weeds”, and you have a perfect man made storm that is wiping out the bee population around the world. Now that we have a fairly clear picture of the situation that the bees and other pollinators are facing, we can start to act in ways that can benefit and promote their survival. 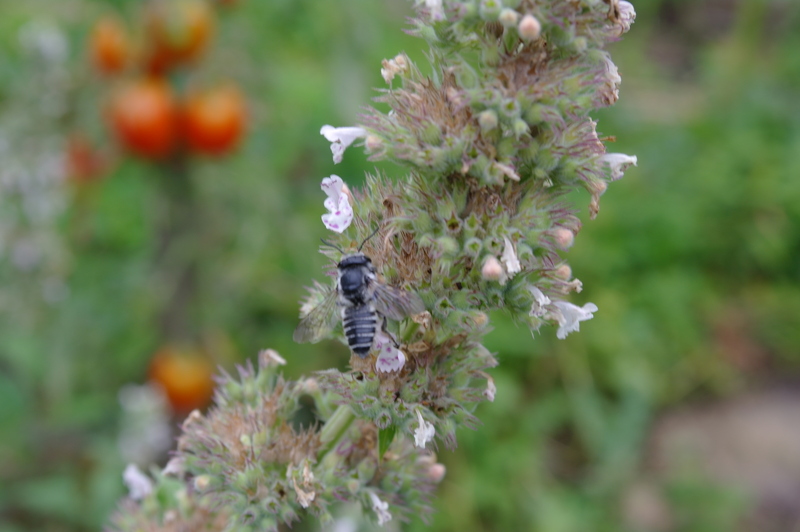 As far as our broad scale agriculture is concerned, it ultimately may not be salvageable, at least in a form that is recognizable to most privileged humans if we want to insure the continuation of pollinator genetics. Bee hives in an almond orchard. Looking at the almond orchards of California as an example gives us a perspective of how large and complicated modern industrial agriculture has become. These orchards, which bloom once a year and cover an area of around 800,000 acres (or roughly the size of the state of Rhode Island), leave nothing else for bees to forage from after the spring bloom is done. The orchards require close to one million of America’s honey bee colonies for adequate pollination each year, for about a three to four week period early in the spring. 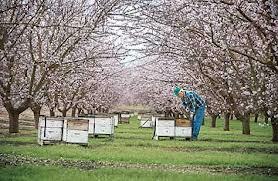 Once the almond trees are done blooming, the migrating beekeepers pack up their bees by the semi load and move on to the next stop in their annual travels. It may be fruit orchards in the Pacific Northwest, or tomatoes and melons in Florida, or fields of alfalfa and clover in the Dakotas, but the constant movement of the bees to one pollination center to another is also weakening them by exposing them to disease due to the high population density of bees from around the country. If these orchards could move away from the monocrop mentality by reducing the amount of chemicals being used and provide other forage (perennial weeds, polycultural alley cropping, etc…) for the bees throughout the year, less bees would have to be shipped in each spring, and little to no high fructose corn syrup would need to be fed back to the bees, and we would start to reduce the demands that we have put onto a large segment of the bee population. Will this happen? Probably not anytime soon. The almond business in California, the largest area in the world where almonds are grown, is a multi-billion dollar industry for California. To question this industry or any other giant agricultural venture and it’s impact on the bees is bad business, and one of the reasons that our food system is balanced on a precipice overlooking collapse. When we value money and profit over the health of ecosystems and all their inhabitants, we are no longer stewards of the land, but slaves to the almighty dollar. Almonds, just like corn or soybeans (these two are not directly dependent on bees though), have gotten so large and complicated, that they are bound to eventually collapse underneath their own weight and hubris. This is where the small scale farmers, urban homesteaders, permaculturists, guerilla and backyard gardeners, environmentalist, and nature lovers can all play a huge role in supporting honey bee health, and ultimately their continuation on this planet. It is true that it will take a massive paradigm shift to change agriculture as we know it, but we forget how powerful individuals, communities, and backyards can be. 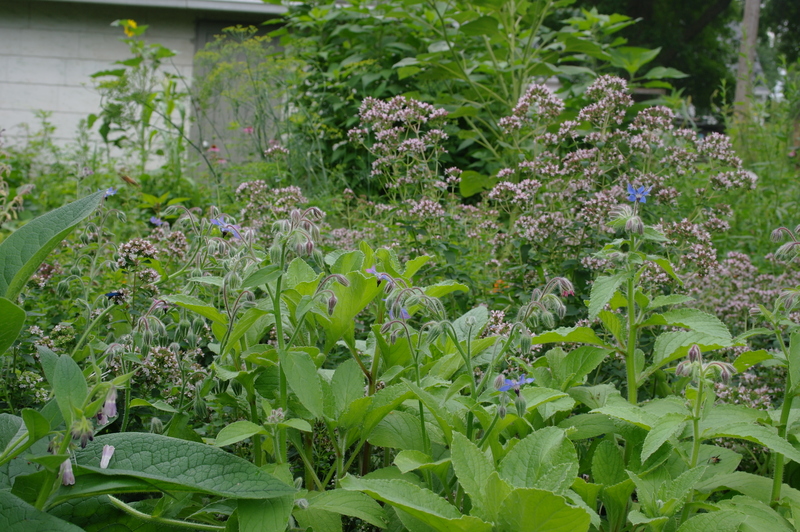 This is a polyculture of wild majoram, borage, winter savory, comfrey, apple trees, and creeping charlie. This area has been covered in pollinators for the last month and a half, providing nectar and pollen. Let’s start in the backyard and boulevards of Everywhere America. The first and most effective step an individual or family can take is to stop treating our lawns like it is royalty. The lawn was a creation of the rich upper class in the 1700’s in western Europe, and was a symbol of wealth by showing you no longer had to devote your land holdings to food production. 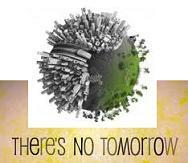 This has continued on into the present and has only gained momentum. There are whole sections of hardware stores and Wal-Marts devoted to this weekend pastime and all of the “Toys” you need to maintain a perfect Victorian lawn. Lawn Boys and Yard Man mowers, leaf blowers, home scaled amounts of broadleaf herbicides to keep the dandelions (and other bee forage) at bay, and a whole universe of different sprinklers, fertilizers, and ornaments that tell your neighbors that you have succeeded in life! All of these to some degree play a role in pollinator habitat destruction. So the first simple step is to ditch all of these inputs and the traditional lawn and start planting bee friendly habitat. While it has become my goal to eventually have no more “lawn”, I do still have areas for the kids to play on and the dog to roll around in. However these areas are packed with creeping charlie and dandelions in the spring, and white clover throughout the summer, all forage for the bees. I will never completely get rid of our lawn because my lawn is an ecosystem, filled with flowering groundcovers and nutrient accumulators that provide pollen and nectar for the bees. It is also a self fertilizing closed loop system that stays green most years with no water except for that which it receives from the rain. One of our girls foraging on a catnip plant. Lets now take a quick look at boulevards, those small strips of land between the sidewalks and the streets and are typically planted with grass. Not only are these once again useless lawn spaces that require watering, fertilizing, and fuel for excessive mowing, they also shed water in huge amounts. If we made it a national effort to start planting our boulevards into rain gardens that were filled with bee friendly natives, perennials, fruiting and flowering trees and self seeding annuals we could increase total acreage of habitat by thousands, if not millions of acres. This is huge when you think about how easy it is to convert a boulevard (or a whole lawn for that matter) to a no-mow, low maintenance landscape that can provide pollinators with forage and retain water in our drying landscapes. And briefly, let us discuss park lands, roadsides, and other forgotten parcels that can also aid the bees in their quest for survival. In my essay Guerilla Forest Gardens I talked about taking guerilla gardening to a new level by starting and tending clandestine orchards and food forests using edible woody perennials, shrubs and groundcovers. This same principle can also be applied when it comes to planting habitat for honey bees, and many of the trees and shrubs that may be used in a Guerilla Forest Garden also provide great forage for bees. Focusing on trees, there are many different kinds that also provide great forage for our pollinating friends year after year. Here in Minnesota great trees to have around for the bees are Basswood, Black Locust, Autumn and Russian Olive, Poplars (bees use resin from these trees to make propolis), Mountain Ash, and any of the common fruit trees that are found in backyards. Even though trees like these only bloom once a year, they can provide so much pollen and nectar at such a crucial time in the season that the more of these trees that are around, the larger the population of bees that can be sustained and thrive in any one region or neighborhood. Trees that thrive here in Minnesota are obviously going to be different than ones that thrive in other parts of the country, so find your local and regional equivalents and get your cities and counties to plant more of them! And if you are so inclined to plant trees yourselves (whether on your own land or in a Guerilla Forest Garden), many extension and county services have tree sales each spring where you can pick up bundles of trees like these for wholesale prices. So aside from making our own yards and farms, local city parks, boulevards, and highway roadsides friendly to bees, what else can we do to aid the honey bees? Ultimately it comes down to education. First and foremost is educating the next generation about honey bees specifically, but nature and biology in general. There has been such a disconnect over that last few decades involving our youth and the natural world that first needs to be addressed. This trajectory follows the bulldozing of what was once rural, agricultural and wild lands, and the rise of the ever present and sterile, cookie cutter suburbs. Most kids no longer have the luxury of getting lost in the local woods, or having adventures around a small creek; mainly for the reason that places like this hardly exist anymore. So not only do our kids suffer from growing up in artificial environments mediated by a TV, an Xbox, and junk food, but these same woods and stream banks that once fueled a childs imagination and play time can no longer feed and house our pollinators. So if there is any hope for the ultimate survival of the bees specifically, and a diverse ecosystem to support them, it lays in the hands of the next generation of young people and adults. People who are not scared of the outdoors or bugs, people who can appreciate simple pleasures, and people who care for the natural world are what we and the bees need to successfully move into the future. And second we need to help educate our families, friends, neighbors, and communities about honey bees and what they need to live healthy, productive pollinating lives. The good news is that everyday, more people are becoming aware about this issue, and all the implications and connections that can be made to habitat loss, GMOs, and pesticide use. The bad news is getting people to act on this new awareness that they now have. A bumblebee on a comfrey flower. Not everyone needs to run out and become beekeepers. Some people just aren’t suited for it, and that is okay. But something everyone can do, and quite possibly more important, is help to create the habitat and healthy environments that the bees need. Tear up your lawns and start planting food for yourself and the bees! 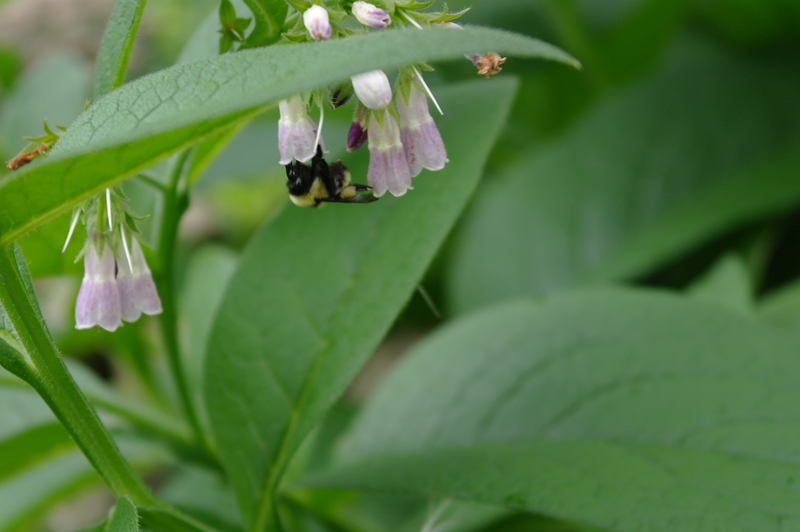 Plant your boulevards in rain gardens that provide forage for the bees throughout the seasons. Quit using the pesticides and herbicides that are killing the bees. Contact your local and state governments about these issues and advocate for ordinances and zoning laws that are friendly to beekeepers and bee friendly habitat. On the local level we can change things, even if it is one small yard or park at a time. True change, no matter how small, starts at home and with ourselves. When our lives and our actions are put out there to be positive examples to others, we can start to change the world. Have the conversations with people who are ready to hear about these issues. Take a class at a local nature center and learn more about the bees. Write letters to your state representatives, boycott and protest Monsanto, go to city council meeting and make your voice heard, volunteer to help out a local beekeeper for a day, read books and watch movies about the bees, and always keep educating yourself. And if you are moved by these little critters to the point of becoming a beekeeper, go for it and find the joy in getting stung a few times (it is really not so bad)! Death. More death here at the Dead End Alley Farm. This time it was our bees. The bees that up until a few weeks ago I thought were going to come through the winter successfully. But as life has shown us recently, nothing is for certain when walking down the path of homesteading. Last fall I brought our bees back to our property in the city after they had unexpectedly swarmed in late August. I knew I would have to help them through the winter (supplemental feeding) because of their small population and lack of honey stores. In early March on a nice sunny day, I decided to open them up and see how they were doing. To my surprise, there was a small cluster of bees right in the center of the hive box. I couldn’t believe it! They had gone through most of the sugar I had given them, so I gave them a bit more and called it good. I left them alone for for about 2 weeks, and checked back on them on another sunny day. Sadly, on this next visit I did not see the cluster, but only a few random bees that were moving along the top bars. I closed them up right away knowing that in the next few days the weather would be warm enough to do a real inspection. That is when it was official, they were all dead, most likely from starvation. Even though I had given them more sugar (not really true bee food, but it can help sustain them), they could not find it. The little bit of honey they did have going into winter was not even touched and only one frame over from their cluster of death. I found many bees with their rear ends sticking out of the cells, a sure sign of starvation. It saddens me that once again I have lost critters that are a part of my homestead and that play such an important role in adding beauty and sustenance to our lives. Most people are aware of the plight that the honey bees have been facing for the last half of a decade. Colony Collapse Disorder hit the headlines back in 2005 and has been a mounting crisis ever since. Here are a couple articles, (and this one) that summarize the history and some of the latest research concerning CCD and the effects it has had on bees and beekeepers alike. Needless to say, it seems overwhelmingly obvious that Monsanto, Bayer Corp, and the other big PHARMA corporations play a huge role in the demise of the honey bee, and need to be held accountable for their actions. While I have never held a lot of hope in letter writing and legislation, it would be wonderful if we could get the EPA and the USDA to ban the use of Neonicotinoids until more independent research can be done without the influence of big PHARMA skewing the results. Places in Europe like France and Slovenia have seen their honey bee populations stabilize since these insecticides have been outlawed, and these countries should be heralded for their efforts in aiding the honey bees. Coming full circle and returning to the dead hive in my backyard, along with the obvious evidence of starvation, I also checked for other possible causes that lead to the death of my bees. On the screened bottom board I found very little evidence of Varroa Destructor, the bane of beekeepers the world over since the mid ‘90’s. If you look very closely you can spot these parasites on bees as well as on a bottom board, and I only found about 10 of them amongst all the bee corpses. This tells me the colony was not weakened by varrao, great news even though the bees perished. Second on the autopsy list was checking for signs of American Foulbrood, a bacterial infection that will wipe out a colony and readily spreads to other hives in an apiary. I have never seen foulbrood in person, but it is unmistakable if your hive(s) are infected, American Foulbrood liquefies developing brood into a brown goo and has a horrendous odor (often described as rotten meat) – hence the name! 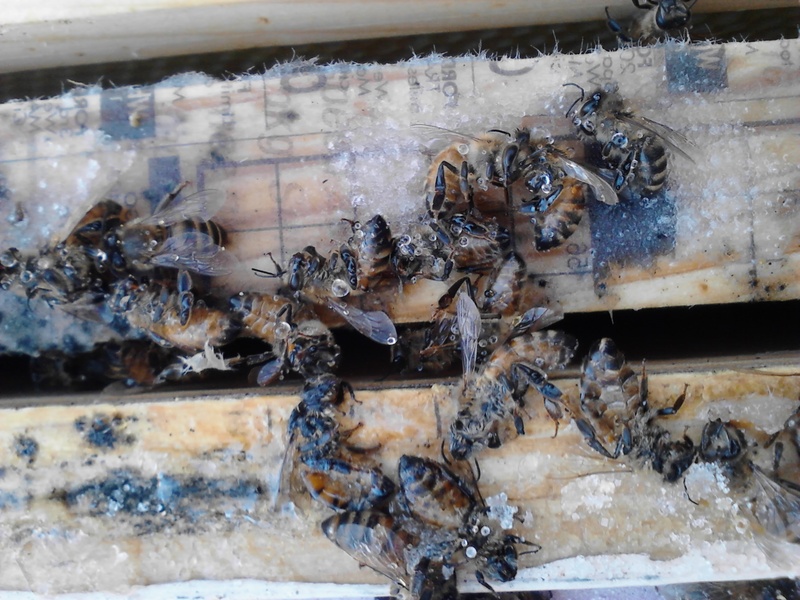 The spores of foulbrood will survive in beeswax, honey, and woodenware, so if you have a hive that has succumbed to AFB, burning the entire setup is the suggested means of disposal. Thankfully there were no signs of foulbrood. Even though there were thousands of dead bees littering the hive box, there was still the pleasant, sweet scent of a healthy colony. The few brood cells I found with developing bees within were healthy and probably only a week or so away from emerging as a mature bee. This also means that the naturally mated queen had already started laying eggs in preparation for the spring. The last thing I noticed, but was not intentionally looking for was evidence of Nosema. Nosema is basically bee diarrhea and is primarily caused by the consumption of refined sugar or syrup. While nosema is not typically fatal to a colony, this should be all the motivation a good beekeeper needs to not harvest honey greedily, and to only feed your bees as a last resort. With the autopsy completed, where does that leave me as a beekeeper? While I am totally bummed out by the lose of these bees that I tried so hard to help through the winter, I am very optimistic in regards to my future as a beekeeper. I have learned a lot in the last year, and the mistakes I have made will never be repeated again! As far as new bees are concerned, here is what I have lined up. Back in December or January I met the beekeeper who supplies my local food co-op with their bulk, raw honey. It turns out they are only about an hour south of me and also sell 5 – frame nucleus colonies for $100. This is a pretty good deal and I am slated to purchase two of them sometime in May! Swarm Traps Ready To Go!! So best case scenario is that I could have up to five colonies by summer if all three swarm traps work, along with the two purchased nuc’s. The swarm traps are pretty much done except for the outer covers which I should hopefully finish this weekend. The traps were constructed out of all salvaged lumber, and painted with discounted outdoor paint (I love when people return paint to the hardware store that was mixed wrong – $3 for a gallon!!). I still have a bit of work to do finishing up the other woodenware I will need. 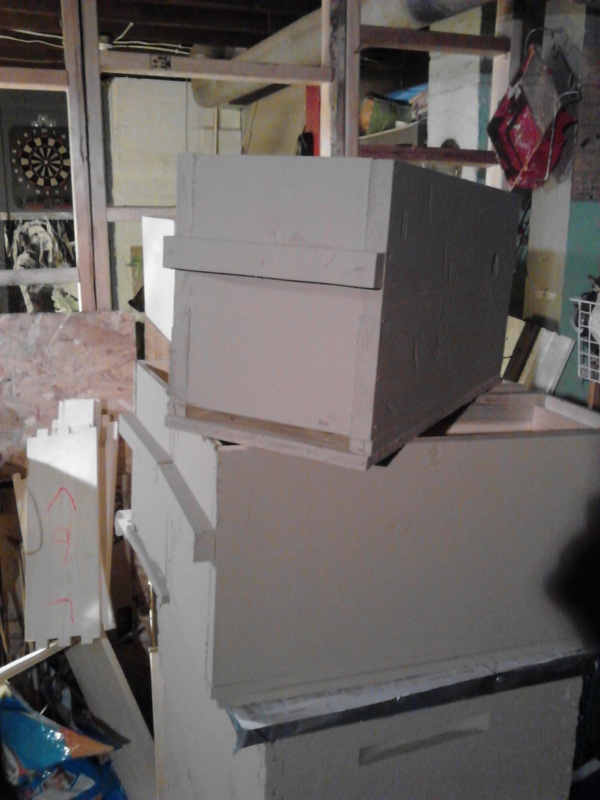 Inner covers, screened bottom boards, and boardman feeders all need to be built, but I already have all the deep boxes and the outer covers to accommodate up to five hives ready to go. If time allows I will do a post soon about the rest of the equipment I need to build.